One of the first questions we ask our clients is “Do you know how much you want to spend on to acquire a new customer?” Most people look at us like we’re crazy. Others try to calculate how much profit they can make from a single transaction. They then come up with the lowest amount they are willing to spend to get a customer through the door. This is not the best strategy. If we want to figure out how much we should spend on our marketing, we first need one important metric: Customer Lifetime Value. 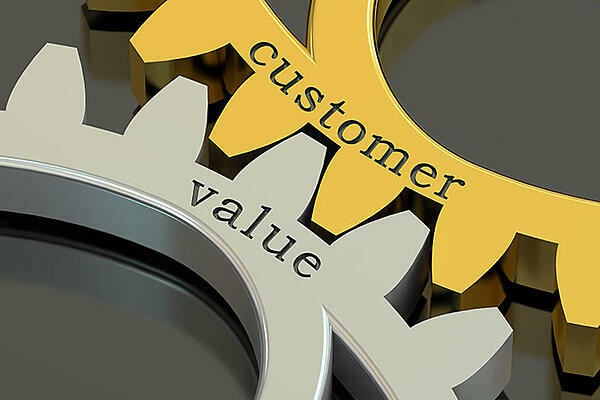 Customer Lifetime Value (CLV) is the total revenue your store can expect from a single customer for the entire relationship with that customer. Businesses who understand the importance of this metric can adjust their marketing strategy and find ways to increase CLV. This metric will influence most marketing decisions in your business. If you have a specific revenue goal, and know your CLV, then you’ll know exactly how many customers you should acquire to reach your goal. The idea is to earn and retain long-time customers and CLV allows you to see the long-term return on your marketing investment. Once you know your CLV you can also start identifying the type of customers that bring in a higher CLV than average. You’ll see how much you need to spend to get the right customers rather than blindly spending your marketing budget and hoping everyone will do business with you. How to find your Customer Lifetime Value? There are several ways to calculate CLV but we’ll give you a simple one we found. Here’s a breakdown of how to calculate it yourself. You’ll need the information below, and you can usually get this from your accounting department or most POS systems. 1. Annual Sales Revenue (ASR)? You should know this number. We’ll be looking at an annual period. Keep this in mind when answering these questions. 2. The number of Annual Sales Transactions (AST)? How many sales transactions took place in your store? Count only the number transactions and not transactions per customer. We’ll get to transactions per customer in the next question. 3. The average number of Annual Purchases Per Customer (APC)? What’s the average number of yearly purchases from each customer. How long does your average customer continue to shop from you? 3. Now we factor in the number of years a customer continues to shop from you to get your CLV. Want an easier way? We’ve done the hard work. Download our Excel Worksheet here for a simple way to find your CLV. You know your Customer Lifetime Value, now what? Let’s start by taking a step back and looking at your customers. Can you identify segments or groups that bring in a higher CLV than your average customer? Maybe certain designs, salespeople, promotions, etc. attract a type of clientele that tends to have a higher CLV. Here are some questions that might help you find common traits:Do they tend to shop more often? Do they purchase more per transaction? How did most of them find your store? How do they like to be communicated to (Ex: Email, Phone Call, Text message, social media, etc.)? Did your most recent marketing campaign bring in more of these types of customers? When you start paying attention to your highest value yielding customers, notice what makes them shop from you, and use that message across all of your marketing, then the results will come in. You’ll begin to notice more customers with higher CLV shopping at your store. We can also start applying this metric to see if you’re overpaying on certain marketing campaigns. Take a look at any marketing campaigns you are currently running. How many new customers are you bringing in compared to the cost of running the campaign? Are you spending more on getting one new customer than your average CLV? Are you spending too little on your marketing and losing business to your competition because they're spending more? Always track and measure your marketing efforts. Your CLV is not set in stone. It is always changing based on things we can and can't control. Bad economic times can cause customers to have less spending money and the jewelry industry, as a whole, can see a lower average CLV. This metric should be measured periodically to make sure it is going up and not down. The next step is to work on the things we can control to increase your store’s CLV. How do we increase Customer Lifetime Value? We’re now forced to look at existing customers and think of ways to get customers to shop more often, purchase more per transaction, and stay with us... forever. The best way to do this is to treat the first transaction as the beginning of your journey with that customer. After all, the word “Lifetime” is in Customer Lifetime Value. You must think of ways to make your relationship with each customer last a long time. We can increase CLV by focusing on three major components that make up part of the formula: Average Transaction Amount, Frequency of Purchase and Customer Lifespan. Any increase in these three will automatically lead to a higher CLV. As you can see, these are all over the places in terms of types of marketing. And the point is to try something, see if your customers respond, adjust, and repeat. You’ll want to allocate a part of your marketing budget to campaigns that aim to increase your customer lifetime value. Remember to download your Free GemFind CLV Worksheet to get your store's CLV in a couple of minutes. Customer Lifetime Value can show you a lot about your business and how to market to your customers. The most important point to keep in mind is that a customer’s value isn’t measured in one sale. The goal is to have customers come back many times over the course of several years. You must invest in each relationship and sometimes this involves spending a little more upfront to earn a customers trust. But that’s ok, because we are all in this for the long run.